Fingerstyle Guitar Lessons, Fingerpicking Guitar Lessons, Guitar Instruction, Beginning Fingerstyle Guitar Lessons, Intermediate Fingerstyle Guitar Lessons, Advanced Fingerstyle Guitar Lessons, Fingerstyle Guitar Techniques, Banjo Roll Techniques, Boom-Chick Arrangements, Solo Fingerstyle Guitar, Beginning Fingerpicking Guitar Lessons, Intermediate Fingerpicking Guitar Lessons, Advanced Fingerpicking Guitar Lessons, TrueFire Guitar Lessons. Buster B . Jones Guitar Lessons, Jerry Reed Guitar Lessons, Chet Atkins Guitar Lessons, Merle Travis Guitar Lessons, Tommy Emmanuel Guitar Lessons, Lenny Breau Guitar Lessons, Guitar Chords, Guitar Theory, Guitar Composition. Whether you're just beginning or an intermediate - advanced player, it's important to build a cohesive, supportive foundation for your playing by developing fundamental techniques for fingerpicking guitar. Put your techniques to use in a variety of different fingerpicking "standards" and original arrangements. Build your repertoire and develop a catalog of tunes you can play for yourself and others to enjoy. Take your playing to the next level by understanding the mechanics and theory of the music you're playing. Focusing on scales, chords, progressions, harmony, reharmonization, arranging, songwriting, and improvising. Brooks Robertson just doesn't need much more than two thumbs, eight fingers and six strings on a wooden box to carry his listeners away. 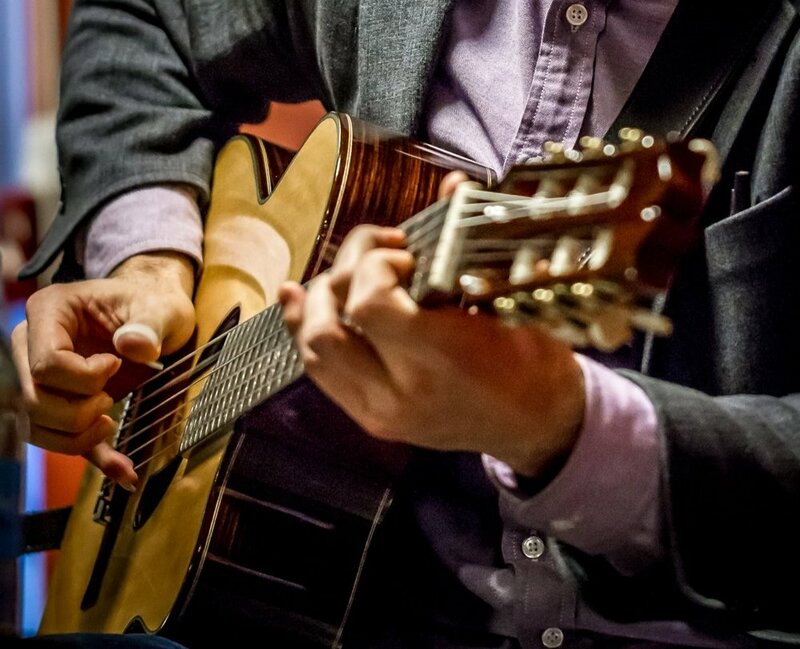 Hailed by prominent exponents of his instrument like Nokie Edwards, Thom Bresh, John Jorgenson and Mason Williams, the young fingerstyle guitarist embodies the creative vision of a postmodern world: It's the music that counts. Brooks utilizes his superb technical abilities to play bass, rhythm and melody simultaneously and surpass the borders of conventional genres. He merges hauntingly beautiful compositions, country rhythms and jazzy harmonies with funky licks into his very own art form – sometimes delivered with a punch, sometimes with a smile. Brooks was born in Eugene, Oregon in 1989. Seeing Buster B. Jones perform at a festival near his home town became a life-changing experience for the kid from the sticks. Just eleven years old, he was immediately inclined to pick up the guitar. Soon, the world renowned fingerstyle virtuoso and instructor dedicated his spare time to introducing his new fan into the secrets of the fretboard, and after six months of lessons the natural talent performed his first show with his mentor. When Buster B. Jones took him under his wings, Brooks began playing high-profile gigs such as the Nokie Edwards Festival, the NAMM Show in Anaheim, the Montreal Jazz Festival or the Walnut Valley Festival in Winfield among others. By the time he was a teenager he had become the youngest endorsee of Godin Guitars and traveled to several states and foreign countries to perform. Brooks went on to play on Garrison Keillor's National Public Radio classic "A Prairie Home Companion" in 2004, where he won first place in a talent competition for 12 to 20 year old participants. In recent years, while still appearing regularly at prestigious events like the Chet Atkins Appreciation Society (CAAS) Convention in Nashville, Brooks focussed on perfecting his craft, soaking up new tunes and styles and techniques as well as blending them into his own groovy and soulful original music. He entered the "Yamaha Six String Theory Guitar Competition", which drew participants from more than 40 countries all over the world. Brooks was invited to perform in the finals at the Broad Stage in Los Angeles in March 2010. A star-studded jury, including Steve Lukather and Lee Ritenour, eventually chose him as winner of the country category and second place winner overall. In addition to worldwide recognition as a performer, Brooks is regarded as an educated, experienced, knowledgeable teacher of Fingerstyle guitar lineage, instructing students from the traditional to the contemporary, keeping the legacy of Fingerstyle alive and well.